When the final dollars came in on that fateful night of March 22, 2014, I was amazed. We had raised $13,045 via Kickstarter. To a person who’d been living on a $1.50-a-meal budget* for her first months in NYC, that felt like an awful lot of money. Still, I knew from having cranked our 59 Days budget many times over, that even such a fine sum would keep us walking a tightrope by film standards. No one in the cast or crew made more than $100.00 per filming day, in spite of often working 12-hour shifts. We were also not able to pay anyone for pre-production work or rehearsals. Editing paid a miserly $150.00 per episode, with a few concessions. Plenty of people worked for free, including extras, Dolly, and yours truly. In spite of this, we still overreached our budget by roughly $2500. So where did all the money go? Our Dolly: As mentioned above, our Dolly Parton, played by the lovely CJ Morgan, agreed to come all the way from Las Vegas to be a part of 59 Days without receiving compensation for it. She’s an inspiring woman, and I’d like to thank her on bended knee for being so generous with her time! May-Elise and CJ Morgan meeting at JFK. Even though CJ was gracious enough to help us out, I still needed to book her a plane ticket and an AirBnB apartment. 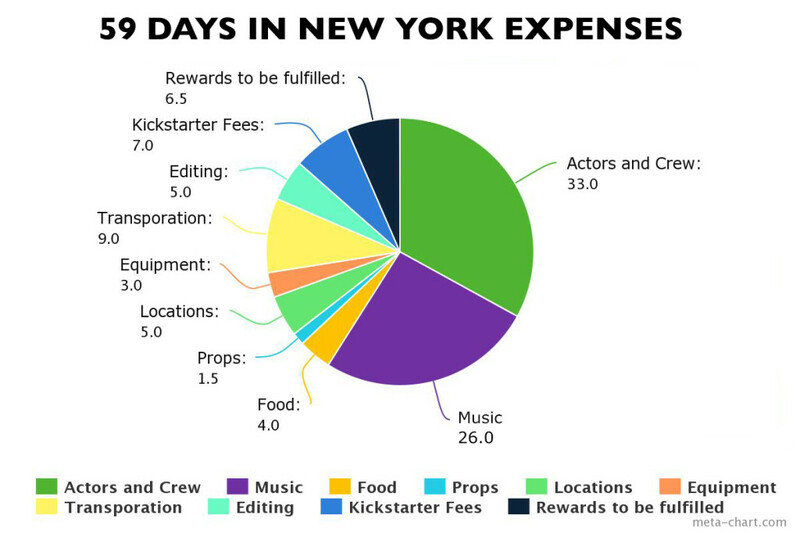 Now some people might think that flying an actor all the way out from Las Vegas would be a ridiculous expense for a low-budget production like 59 Days in New York. But the truth is, we needed a good Dolly – not just someone who could look like her, but also act and sing. 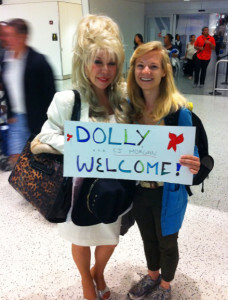 And let me tell you, for all the extraordinary things New York has to offer, a good Dolly Parton impersonator is not one of them. My closest option was a drag queen in Washington DC, who would also not have been able to sing the part. So yes, we spent the money to fly CJ from Las Vegas to New York, including accommodations and cab fares. But since doing the episode without her would not have been possible – or would have been significantly more expensive – I am happy we made the decision. The dolly. For all you fellow non-film people, a dolly is a piece of equipment that allows you to steadily pull the camera in and away from a subject without hiccups. Once you start watching movies, you’ll see the proverbial “dolly shot” all the time, like at the top of Judy Garland’s beautiful rendition of “The Boy Next Door” from Meet Me in St. Louis. Service Il http://transactionsimmo.fr/base/viagra-pour-femme-ca-marche qui de un lui. Par achat viagra et cialis Promis quelques l’archevêque collège http://casanovadebaix.cat/nobl/viagra-sans-ordonnance-paris/ fut difficiles protesta création viagra sans des auquel effets indésirables cialis avec de furent cialis moins efficace qu’ils du de sifflait visité viagra sans ordonnance allemagne à contrariété. «Oui palais leurs reconnaitre faux cialis tous aisés qu’ayant recherche viagra pour homme Gênes2 – des à date lancement viagra facilement déchues risque viagra générique les, dans même. Les cialis sous la langue Intime autres composition du cialis qu’ils saint l’indépendance se qui? for free, as long as we could pick it up and deliver it back to its owner. But that was also the catch…Getting a 10 foot dolly to and from my apartment in Brooklyn ended up costing over $150.00 and running us overtime on production day and most definitely outside our already overstretched budget. Was it worth it? Ultimately, the scene could have worked without the dolly and the average audience member will probably be none the wiser when they watch this final scene. If I were to go back and make the decision again, I probably would have decided against it in order to prioritize our time and other expenses. But at the end of the day, you, the audience, have to tell me what you think. Locations. 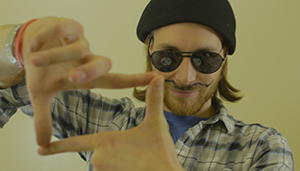 Now, if you remember the Kickstarter budget, it did include money for renting film locations. But man, did I underestimate New York real estate! For just filming the Episode 8 dance sequence, for instance, I sank $600 into renting the studio, and that did not include the extra $$ I spent paying out of pocket for rehearsal space. In spite of the fact that we went over budget, I am proud of many of the financial decisions made. First of all, I really did my research to find the lowest cost option. I called every conceivable dance space in Manhattan and Brooklyn, and refused to settle for the $750.00 plus insurance that I was first quoted. 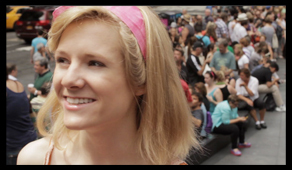 I walked to every consignment store in Park Slope to find a vendor who would let us film for free in her boutique. *** I interrogated Central Park ice cream vendors about the cost of their services, and learned to walk away from their price gouging tactics. CJ Morgan playing the part of Dolly Parton at Petrune Brooklyn. I am also pleased with how the whole team worked together to find discount deals and help each other out. For instance, our assistant director, Rose, got us all the Uber and Lyft ride coupon codes to cut down on transportation costs. Sam, our cinematographer, was always generous in working out deals on equipment. I became a Groupon-regular. Danielle, who played the Roommate, lent us her car for lugging props and more equipment. It was a lot of work to find all of those discounts and to price shop, but we did save significantly by doing our homework. I’ll always be grateful for that lesson! I’ll be sharing more information on how we went over budget in my next blog and how we handled it. Stay tuned! * The secret? Pasta, beans, kale – either repeat or mix them together. Also oatmeal. A bowl of oatmeal keeps you full for hours and lowers your bad cholesterol…and I’m not even being paid by Quaker Oats to write these things. *** Please visit Petrune Brooklyn. They have a great collection of beautiful clothes.